The Chagall Suite is an eight-movement piano suite inspired by eight themes of Marc Chagall's artworks: Vitebsk (his Belarusian hometown), the Bible, the circus, lovers and flowers, Jesus and Isaiah, Paris, nature, and angels. The piece was commissioned by Chagall scholar and lecturer Vivian R. Jacobson and her husband, Ralph, in honor of their 50th wedding anniversary. Mrs. Jacobson also commissioned "Conversations," an improvisatory musical meeting of Chagall and Elvis Presley, which fuses together Russian classical themes, klezmer, rock, blues, jazz, and gospel. It was composed to complement Mrs. Jacobson's lecture on Elvis and Chagall. 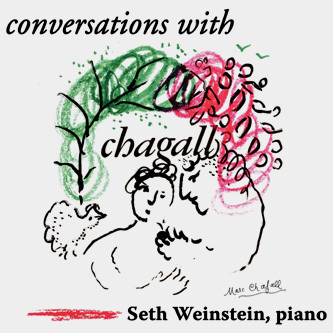 I have performed both pieces in Germany, France, and the USA, and I recorded them on my 62-minute CD Conversations With Chagall, available at CD Baby. Links below point to MP3 files. Depending on your browser settings, either the files will play automatically or you will be prompted to save them first. 1 CONVERSATIONS (11:34) A musical meeting between Marc Chagall and Elvis Presley. The piece is a synthesis of Russian-style classical themes, Jewish klezmer music, romantic ballads, rock, blues, and gospel. 2 I. Vitebsk (7:44) A day in the life of Chagall's provincial Belarusian hometown, with themes suggesting the sunrise, prayer, work, school, and Chagall's ubiquitous "fiddler on the roof." 3 II. The Bible (7:22) A trip through the Creation, winding up slowly and becoming more active until God rests from His work at the end. 4 III. The Circus (4:12) In a quick 7/8 meter, with episodes suggesting clumsy animals, graceful dancers, swift acrobats, and snake charmers. 5 IV. Lovers and Flowers (7:04) Begins with an expanding chord, like the blossoming of a flower, which supports a tranquil melody and eventually gives way to a lovers' waltz. 6 V. The Prince of Peace, Jesus, and the Prophet of Peace, Isaiah (7:01) Dominated by a placid, consonant barcarolle, which quickens and intensifies, supporting a bright melody. 7 VI. Paris (4:21) Anchored by a grand fanfare, which is repeated at intervals and interspersed with interludes suggesting stately architecture, amorous waltzers, and the city's frenetic pace. 8 VII. Nature (6:13) Nature is based on symmetry; the movement's chord structure and melodies evoke symmetry and geometry. 9 VIII. Angels (6:40) Suggests some of the harmonic progressions of the earlier movements, and it becomes bright and bold before returning to the "sunrise" theme of the first movement. Review: "Jacobsons' Commissioned 'Suite' a Joy"